When he was asked by the media yesterday if the absence of a congratulatory note from President Donald Trump to Vladimir Putin on his re-election victory - which was marred by numerous alleged voting violations - was an unfriendly move, Kremlin Spokesman Dmitry Peskov answered that it wasn't, adding it would make sense "to sleep on it." "This should not be regarded as an unfriendly step. Putin remains open to normalizing relations with our US partners, where it is of interest and crucial. The president has been getting many congratulatory messages from foreign leaders. Some may be unable to make a phone call due to a tight schedule, and others, for a different reason. There is no reason to make a mountain out of a molehill about anything here. Lastly, there is a good old saying: ‘Sleep on it’," Peskov noted. Meanwhile, speaking to reporters, White House Deputy Spokesman Hogan Gidley told the media on Monday that he was "not surprised by the [election] outcome" and added that currently there are no plans for a telephone conversation between Trump and Putin. The next day, however, Trump appears to have "slept on it" as Peskov recommended and moments ago the Kremlin said in a statement that on Tuesday, Trump called Putin oh the phone and "congratulated Vladimir Putin on his victory in the presidential elections." Additionally, the two leaders discussed the possibility of a high level meeting, and both showed an interest in kickstarting economic cooperation. The two presidents also discussed strategic stability, North Korea, and energy. The Kremlin notes that the "talks were constructive, business-like, focused on overcoming bilateral problems that have piled up." 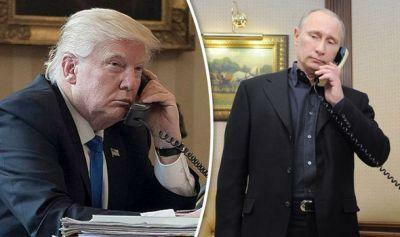 Amusingly, Trump's congratulatory phone call to Putin is not the most controversial one: earlier, EU president Jean-Claude Juncker risked British ire by congratulating Vladimir Putin on his re-election as Russian president, just one day after the EU offered the UK its “unqualified support” over the Salisbury spy attack. The president of the European Commission, which is leading the Brexit negotiations on behalf of the remaining 27 member state of the EU, wrote to the Russian leader on Tuesday. "Excellency, Mr President," he wrote, “I wish to convey my congratulations on your re-election." Then again, a little under half of Europe's energy needs comes from Russia so one would expect Juncker to demonstrate civility. As for Trump calling Putin, clearly the only logical explanation is that he was, is, and will forever remain forever a Russian operative deeply rooted inside the White House working exlusively for the Kremlin, or at least that's what CNN will explain shortly.